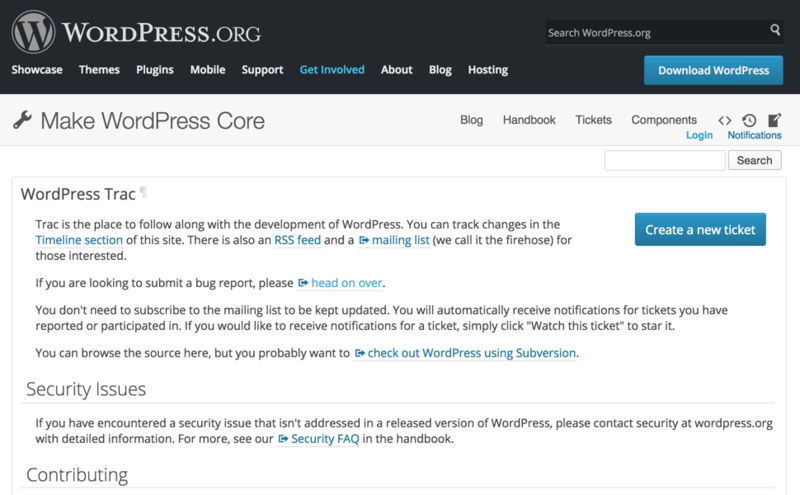 Undoubtedly, WordPress Core would benefit from a larger number of active developers. The system, especially Trac1, might be, however, too complicated for newcomers to work with. That goes for me too. Do you know what’s the best way to learn something? Write an article about it, of course. That’s what I’m going to do: write a post about what the Trac is, how to use it and so on. I’m going to use a lot of screenshots to accomplish the task with an ease. 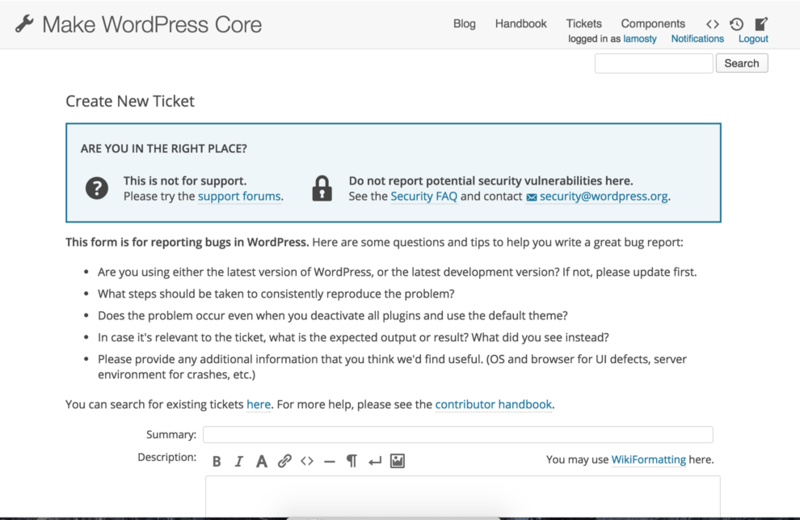 “Trac is an open source project that serves as a bug tracker and project management tool for WordPress.”2 Simply put, it’s the place where WordPress itself is developed. 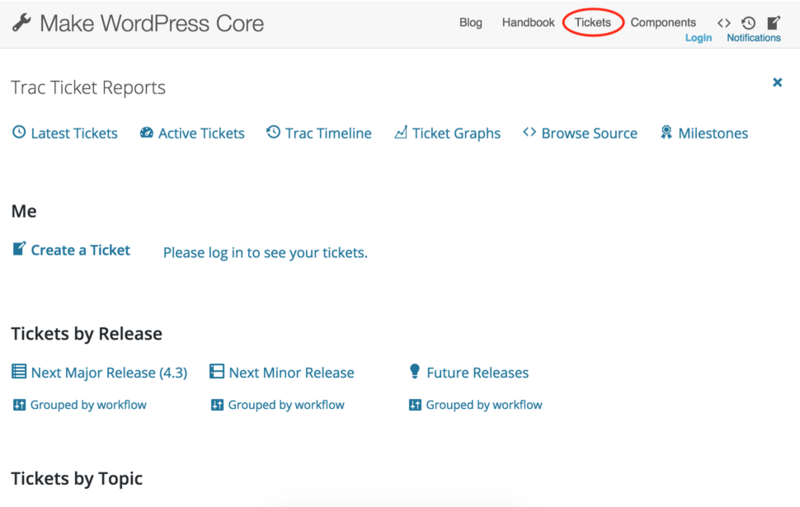 With Trac, we can contribute to WordPress by creating tickets (reporting bugs), working on unsolved tickets and testing the ticket patches (fixes or solutions) submitted by others. 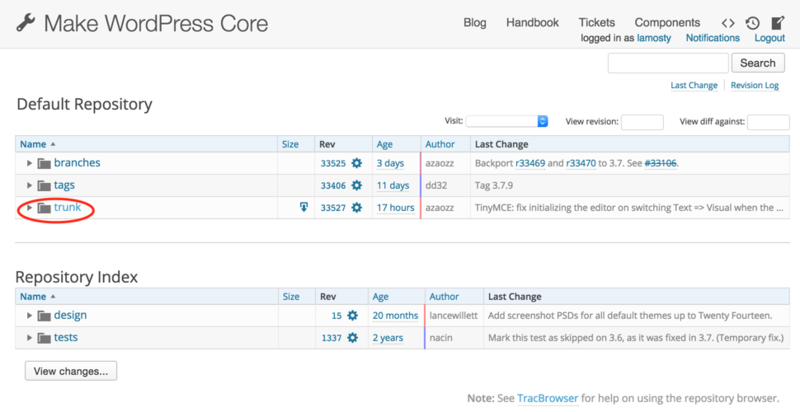 Trac is the first thing a new WordPress developer has to get familiar with. And that’s where the problem lies: people are deterred from contributing to the Core (or studying how to do so) because the first thing they get to see is Trac, which becomes one of their largest barriers to entry. …screen by screen. Navigate to Trac homepage1 and follow the steps from there. This part is, too, divided into several subparts. The two most important links here are “Latest Tickets” and “Browse Source”. The highlighted tickets (yellow color) are still “Awaiting Review”, so they have not yet been reviewed by a Core contributor. Latest Tickets table is an important place allowing us to choose a good-sounding, eye-catching ticket and work on it. However, the best tickets for beginners like us are to be found on the Good First Bugs page3. Will discuss that a bit later. The next thing we’ll talk about is the “Browse Source” screen. You can get on it by clicking on the link “Browse Source” in the Trac Ticket Reports section of the Tickets screen. 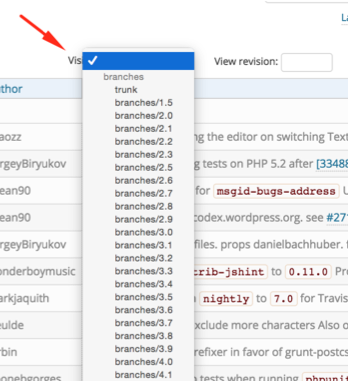 The red circle is showing the “trunk” folder; try clicking at it — you’ll be presented with the WordPress project files. You know what gets on my nerves? The sluggishness of the code browser… It’s so slow that I prefer to use the GitHub mirror7 of the SVN repo and browse the files there. Tis iz not about me, rather about the actions you, as a WordPress.org user, can do in Trac. 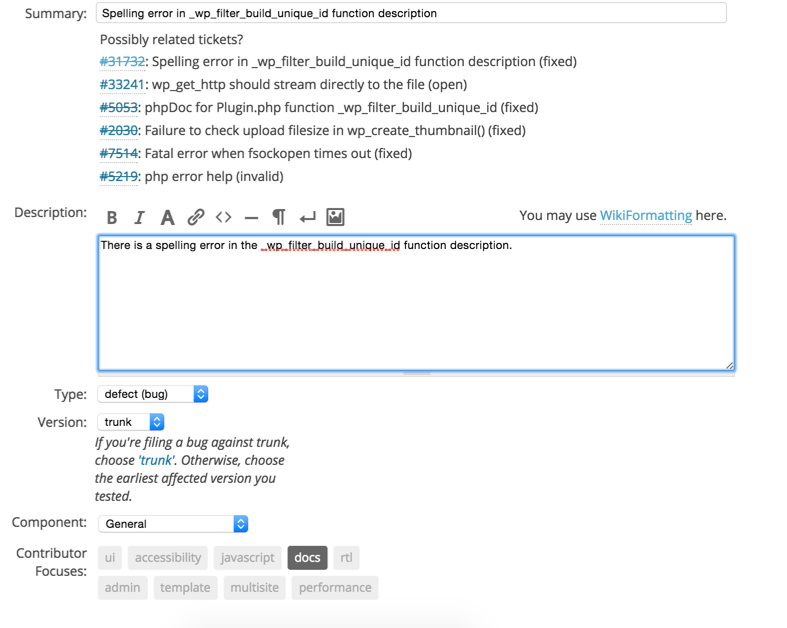 Basically, you can create (submit) a ticket and then attach a patch (code fix) to it. Let’s look how we can create a ticket. This screen is a ticket filter, helping us to select those ones we want to work on. These are the tickets which have already been patched (fixed) but in order for them to be accepted into the Core, they need more user testing. A good starting point if you are afraid of jumping right in. Are you confident in your WordPress and reasoning skills? Do you want to be the first to solve a problem? These are the tickets which have been reported but still don’t have any patches (fixes). These tickets were marked as “Good First Bugs” by Core developers. That means they are probably easier to fix and understand. I would start with these if I were you.